It’s not every day that you read a book that humbles you intellectually and makes you really think about how you think! This book is the result of decades of (Nobel prize winning) research on human psychology, cognitive biases and rationality by a leading authority in the field of decision making and behavioral economics. It’s humbling, because the realization that the decisions that you make/the beliefs that you hold are sometimes not out of your own free will can be a startling find, to say the least. 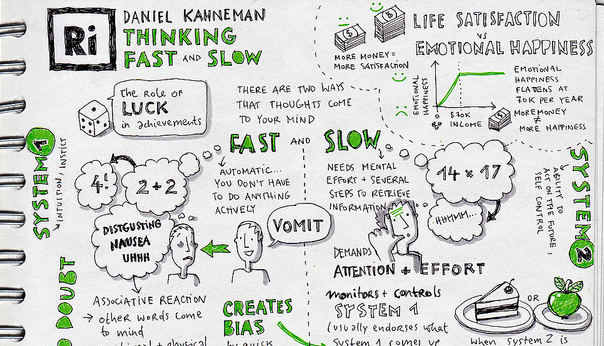 The author, Daniel Kahneman has condensed years of professional research work into this gem of a book. If you are a noob like me who doesn’t know anything about neuroscience/psychology, fret not! Although the topics discussed are extensive in both their explanations as well as possible implications, they are presented in layman’s terms with some witty anecdotes thrown in. I couldn’t help but think about the whole Damore memo fiasco while I was reading this book. It’s easy to see how events like that can be so polarizing, even among people who usually share a common point of view. The author makes a strong case with research proven examples for how we process new information in such a way that it already fits the existing narrative in our mind¹, and how when we are posed with a difficult moral quandary, we simplify it to an easier question (which is much different from the original problem) and then try to answer that². It’s not a self-help book, far from it. The book is long, challenging at some places, and would certainly require an effort on the reader’s part to spend considerable time processing all those psychology breakthrough theories and its real world implications. But if you are looking to pick up something new that would challenge your existing notions about the world we live in and encourage you to think more critically, then look no further!